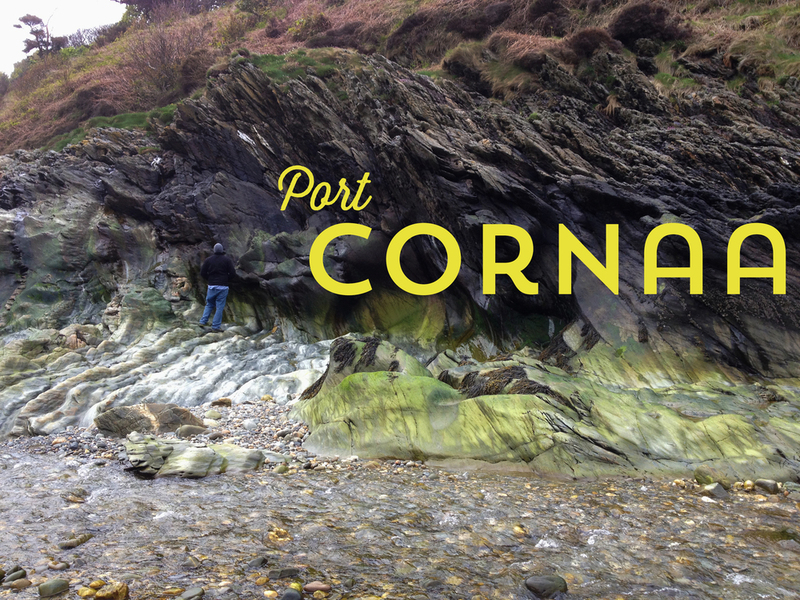 We were way too cozy at the woolen mills, so we decided to head to Port Cornaa—a hidden gem of a beach that the owner of our cottage recommended we check out. I'd love to see this place when it's sunny and warm! It was beautiful, of course, but the wind was kicking and it was cold. Scott examines the unique geological structures. And for reference, this is what I looked like taking the above picture. I'm not kidding when I said it was cold. It was cold enough for me to wear a hood and mess my hair up all day. First world female problems. Once we had each collected a few pounds more of rocks and driftwood for our budding rock collections, we decided to go to Maughold to see the church and collection of ancient Celtic crosses. Maughold was once the site of a Celtic monastery (around 600 AD) and now houses a collection of ancient crosses from the Island. I had high hopes for this visit: I carried a bunch of art supplied across the ocean with me so that I could make charcoal rubbings of these crosses and potentially turn it into really awesome (free) artwork. 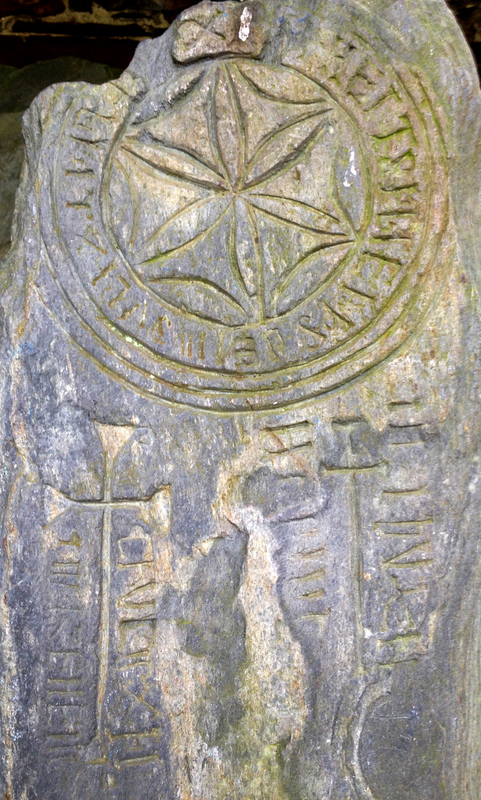 Ancient Celtic cross from Maughold. So unfortunately, the charcoal rubbings...didn't quite work as I had planned. What with the crosses being, you know, thousands of years old and on less-than-even surfaces, my rubbings mostly looked like they were of a driveway in suburbia. I also gave the rubbings a shot with some colored pencils, which worked slightly better, but only slightly. Someday I'll scan them and see if I can clean them up in Photoshop, but for now, these pictures are pretty cool. The whole scene was really beautiful. Not to mention quaint. Gents! Yep, I'm the American who took a picture of the bathroom signage. By this time it was raining and my gloveless, charcoal-covered hands were half frozen, not to mention there was a wedding party gathering at the church, so we decided it was time to go get lunch. We headed back to Ramsey and ate fish and chips (OF COURSE, I had to at least once) at the Royal George. We also had cider that was really strong, but didn't taste like it. In other words, the best kind of cider. "Well, I mean..." our official motto of gluttony. "Mushy peas" were a side dish often served in the Isle of Man. Though they look disgusting, they weren't actually bad. Just odd. It was peas served in a pea puree. There's a reason why the UK isn't known for its food. Side note: does anyone else remember that song "Fish and chips and vinegar, vinegar, vinegar" from their childhood? I thought it was from Looney Tunes, but apparently it's a scout song. Huh. Anyway, this was stuck in my head for several days of our trip. After our boozy lunch, we drove (ok, most of us boozy-napped and one person drove) to the northernmost part of the Island, the Point of Ayre. Continuing on with the theme of the day: cold, windy, pretty. Not necessarily in that order. The beach was never-ending and full of perfectly smooth rocks. 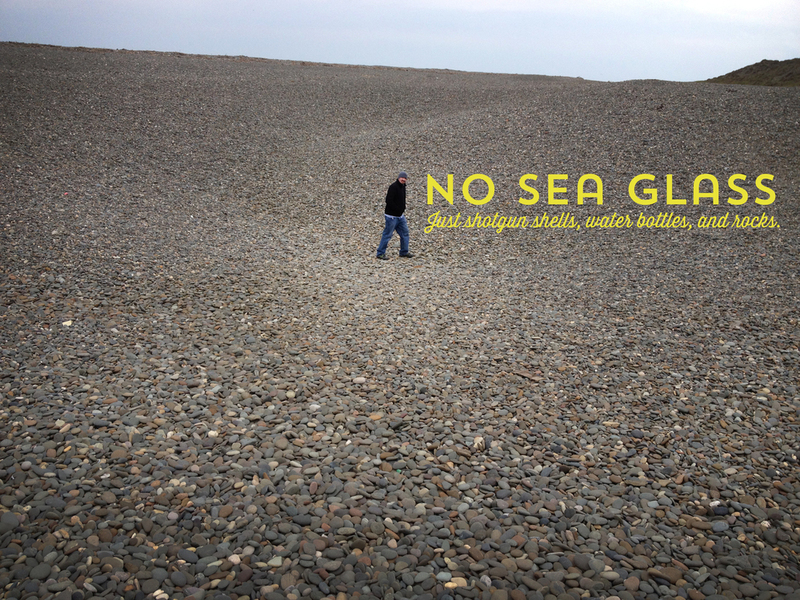 We searched for sea glass, to no avail. After several excursions to chilly beaches (I'm still trying to imagine people on holiday in the Isle of Man, trying to get comfortable on a beach blanket thrown over some rocks) it was time to head into town to reverse the effects of our drinking lunch with a quick stop for coffee and wifi. Scott's mom caught the electric railway home, so we decided to get a ride in the car to her stop and walk with her the rest of the way to the cottage—about a mile or so. A few minutes in to walking, I began feeling like I really wanted to run. Insert pangs of urgency to cross off running bucket list ideas like "take a run in every country you visit" here. Nevermind I wasn't properly attired to run (*cough* *no sports bra* *cough*). I decided it would be like my own Runner's World Rave Run photoshoot and I'd just go for it. The views were worth it, and I was hardly winded (amazing, given my recent lack of running). View from my run in the Isle of Man. After that I refueled with wine and crisps. AKA potato chips. What? It's vacation. 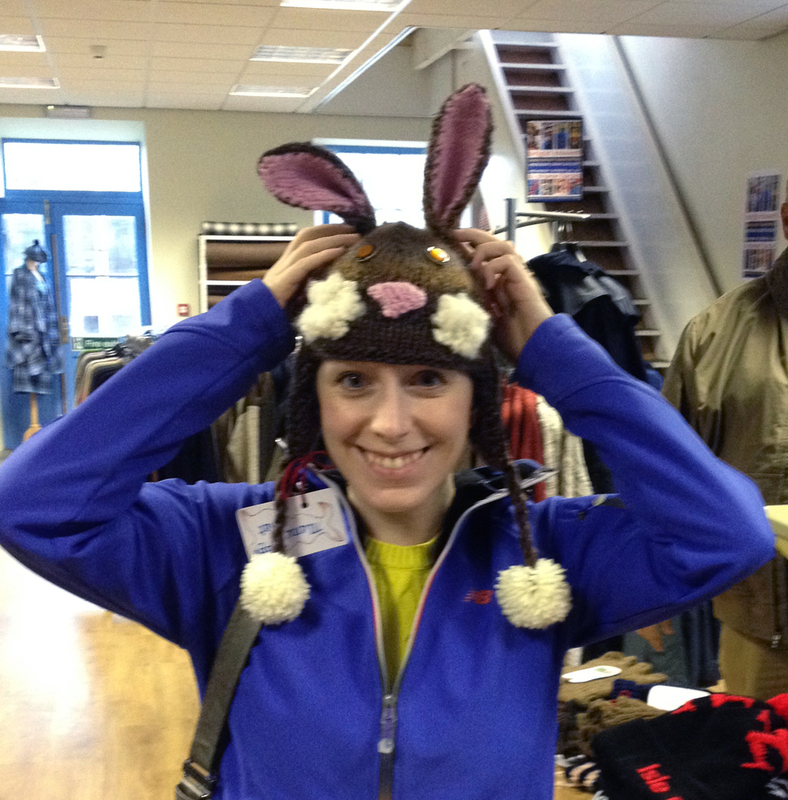 The following day was our last in the Isle of Man (sad panda). It was sort of a weird day, because we had to be out of our cottage rental and return the car by a specific time. Not to be hurried, we had an early lunch in Douglas where we desperately tried to spend the rest of our Manx money. I may have mentioned this before, but the Isle of Man has its own currency, and it's pretty difficult to get it exchanged to dollars back in the United States—not to mention it was a bank holiday in the Isle of Man, so we couldn't exchange it there, either. After lunch, we took one last stop to Tynwald. What would the Manx equivalent to "Dolla dolla billz, yall" be? "Poundy poundy poundz, mate"? Tynwald is where (supposedly) the ancient parliament of the Isle of Man would meet. It's said to include dirt from all 17 of the island's parishes and has been around since the late 1300s, where several Lords of Mann were inaugurated. Apparently, the ceremony of "making public proclamations from mounds" is a Norse practice (thank you, Wikipedia). These days, parliament meets there once a year, on July 5th, for Tynwald Day. This is a long introduction to some pictures of sculpted earth! 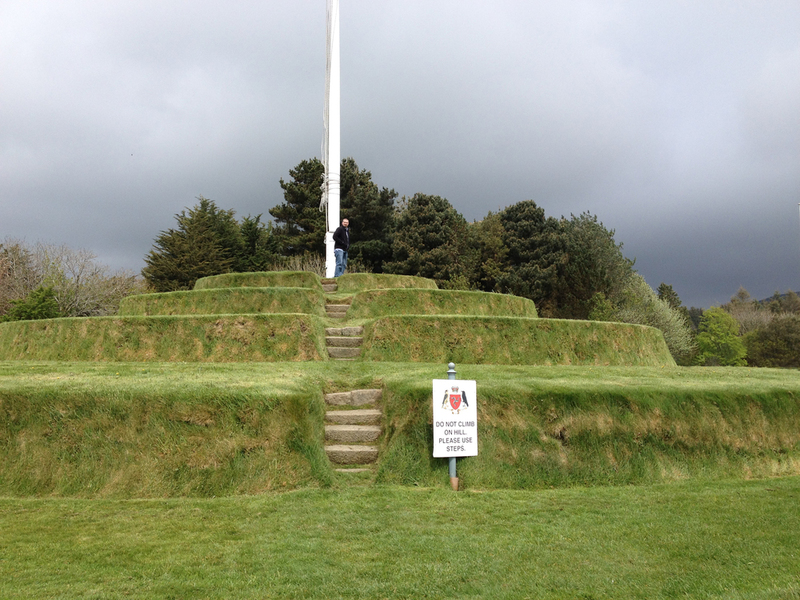 Tynwald Hill on the Isle of Man. Insert joke here about Scott legislating from the hill. And that, friends, concludes our tour of the Isle of Man. Thanks for sticking with the blog recaps as they spread out over, uh, six weeks. 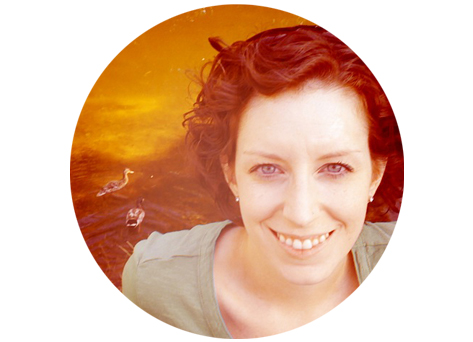 I may write one more post for advice on traveling to Ireland and the Isle of Man and also on what the hell to pack, as I would have found suggestions for that very helpful (and Google failed me as I pondered my empty suitcase). But before I go, one last photo. Sad selfie on the plane, with Scott's mom photobombing. I had to force myself to stop laughing and make a sad face.